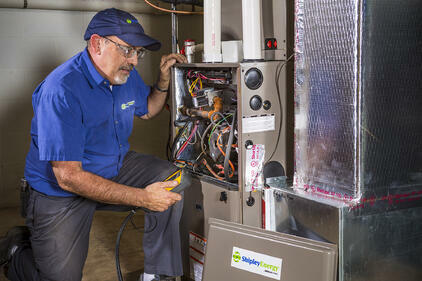 It's never too late (or too soon) to think about upgrading your furnace. There are a lot of signs to indicate that it's time for a replacement, but below are five of the easiest ways to tell that it's time to upgrade! Did you know that if your furnace is 15 years old or more, that your heating efficiency drops by at least 15%? The lifespan of most furnaces is 10-20 years but simply upgrading to a new ENERGY STAR model furnace or boiler will absolutely save you money on heating costs. While the energy market and weather are unpredictable and out of your control, you shouldn't see a significant increase in your heating bills if you've regularly had your furnace cleaned and have had your ducts sealed. A furnace that's on its way out will usually show you by a sudden, sharp increase in your heating bill. It's typically a good indication that it's time to start looking for a new furnace. If your furnace is making a lot of noise, that's usually the most common sign that your furnace is heading towards the end of its life. If you hear clanking, rattling, or banging followed by your blower frequently turning off only to come back on and blow cold air, it's time to look into purchasing a new furnace. If some of the rooms in your house are too hot while others are too cold, it could be a sign of improper equipment orientation, duct problems, or just an issue with insulation. However, if you find that you are constantly adjusting your thermostat and can't reach a comfortable temperature, there is a good chance that your aging furnace is having trouble distributing heat evenly throughout your home. Does your furnace meet one (or all) of the warning signs? If so, it's probably time to start looking for a new heating unit!